9 oz of precooked snails (optional). 4 or 5 parts of water for one part of rice. * Other beans and vegetables could be added locally, like “Roget”, “Tavella” and artichoke (Depending on the season). ** The garrofón could be fresh, frozen or dried. If it is dried, it must be left to soak the day before and boiled for 1 hour (20 minutes using pressure cooker). Cut the meat, don’t season. Chop the green beans into bite-sized pieces , peel the garrofón and grate the tomatoes. Pour the oil into the pan and then heat the oil over a low heat. Once the oil is hot, add the chicken first, brown on all sides. When the chicken is brown set it aside or move to the outer part of the pan (remove from heat), add the rabbit and brown on all sides. This step is very important. Don’t hurry, it is part of the secret of a good paella. 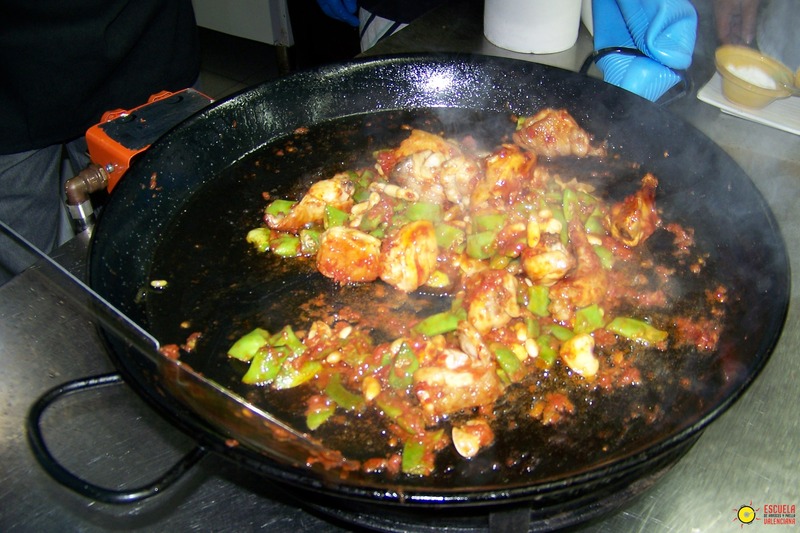 In the middle of the pan, stir-fry the ” batxoqueta ” and, if we have it, the ” roget ” . 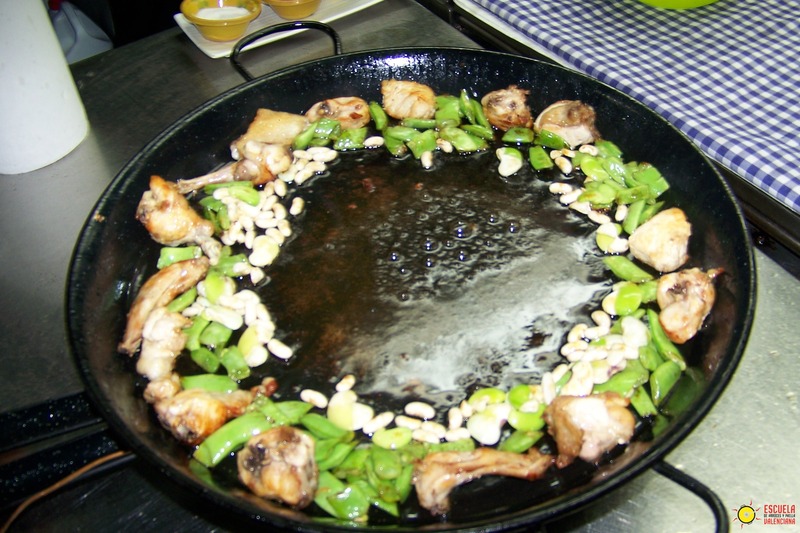 Carefully stir-fry, Avoid burning it, then add the “garrofó” and the “tavella” if we have it. Stir-fry. Move aside the vegetables to the outer part of the pan and pour the grated tomato in the middle, add salt and stir-fry. Tomato is ready when it loses all its water. Then, add a teaspoonful of paprika and stir to combine quickly. Stir everything together and continue frying for a few moments, 1 min max. Next pour the water into the pan until it reaches almost the top of the pan. Bring the mixture to the boil, when it starts to boil add the saffron. Then add a few pinches of salt and add the fresh rosemary twig. Remove the rosemary in 10 minutes to avoid an excess of flavor. Cook over a low heat for 30 to 40 minutes, or until water reduced by half. Test by placing a soup spoon vertically into the pan. If the broth doesn’t reach halfway, add water to get to the middle of the spoon. Once finished, add the snails. To add the rice, cut a line through the middle pan with and inch or two of room, creating a valley in the broth. Pour in rice along that line until the rice fills to the top of the broth, creating a dividing mountain range. Use as much or as little rice is needed to create this mountain range of rice. Then with a spatula very gently swirl the rice around the pan. Distributing the rice, meat and vegetables proportionally. Do not touch after this. Return the mixture to the boil and cook the rice over a fairly high heat for 5 minutes, then medium heat until the broth dips below the rice, then very low heat for the last 4 or 5 minutes. Total boiling time of around 20-35 minutes. If the paella came up short of broth, lower the heat to the minimum and cover the top aluminum foil to reduce evaporation. If you are brave and you like the “socarrat”(the bottom of the rice is toasted and stuck to the pan), at the end of the cooking turn the heat up to the maximum for a minute or place the pan directly on the embers if you are cooking in a wood stove. To be totally true to the tradition, the Paella must be eaten using a wooden spoon and directly from the pan. Enjoy your meal!